kate spade new york | 25% off all sale items! If you're anything like me then you too adore cupcakes, confetti, little bow stud earrings, fancy flats, and all things kate spade new york. Oh, and a good sale? Um, yes! I'm always down for a good sale! So imagine my excitement when I found out that right this second, kate spade new york is having a really huge an amazing sale! 25% off all sale items, to be exact! That's 25% off merchandise that is already marked down 50% off. From everyday pieces like handbags, and wallets, all the way to things like their super awesome daily planners (which I highly recommend, btw) - right now really is the time to stock up on all kinds of fabulousness for Spring! Want to know what's most exciting? That's the fact that there are so many items in the sale section that would be perfect for wedding or even bridesmaid gifts! So what are you waiting for? Hop to it! Just use the code: HOPTOIT at checkout to enjoy an extra 25% off all sale items! But you'll have to go quick because this sale ends 3/28! 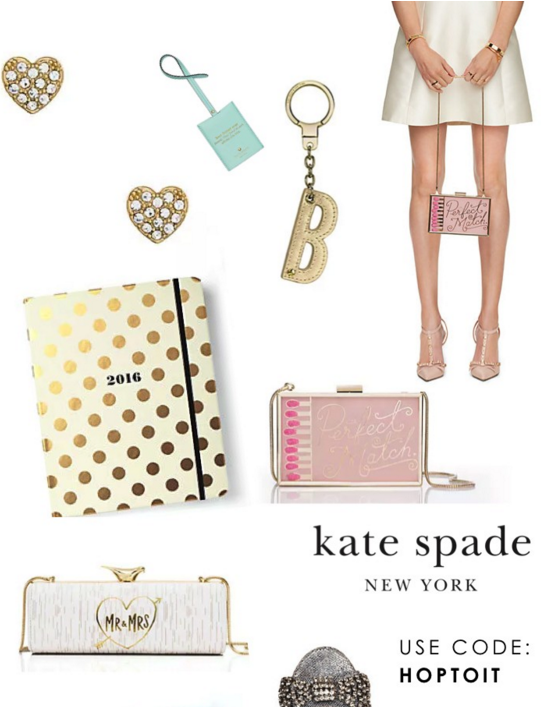 No Comment to " kate spade new york | 25% off all sale items! "